This post introduces John Michael Greer as a new contributing editor on PeakProsperity.com. John is proprietor of The Archdruid Report where he writes regularly on the future of industrial society. But from time to time, he'll pen an especially deep-diving report exclusively for the Peak Prosperity audience. Welcome, John Michael! One of the most dangerous mistakes possible to make in trying to understand the shape of the economic future is to think of the fundamental concepts of economics as simple and uncontroversial. They aren’t. In this and future essays here at Peak Prosperity, I will explore a number of things that seem, at first glance, very obvious and basic. I hope you’ll bear with me, as there are lessons of crucial and deeply practical importance to anyone facing the challenging years ahead. Our co-host here, Chris Martenson, likes to remind us all that money is not wealth, but a claim on wealth. He’s quite right, and it’s important to understand why. Money is a system of abstract tokens that complex societies use to manage the distribution of goods and services, and that’s all it is. Money can consist of lumps of precious metal, pieces of paper decorated with the faces of dead politicians, digits in computer memory, or any number of other things, up to and including the sheer make-believe that underlies derivatives and the like. Important differences separate these various forms of money, depending on the ease or lack of same with which they can be manufactured, but everything that counts as money has one thing in common – it has only one of the two kinds of economic value. Economists call those use value and exchange value. You already know about them, even if you don’t know the names. Odds are, in fact, that you learned about them back in elementary school the first time that one of your classmates offered to trade you something for the cookies in your lunchbox. You then had to choose between trading the cookies for whatever your classmate offered and eating them yourself. The first of those choices treated the cookies primarily as a bearer of exchange value; the second treated them primarily as a bearer of use value. All forms of real wealth – that is, all nonfinancial goods and services – have use value as well as exchange value. They can be exchanged for other goods and services, financial or otherwise, but they also provide some direct benefit to the person who is able to obtain them. All forms of money, by contrast, have exchange value but no use value. You can’t do a thing with them except trade them for something that has use value (or for some other kind of money that can be traded for things with use value). Most people realize this. Or, more precisely, most people think that they realize this. It’s still embarrassingly common for people to forget that money isn’t true wealth, and to assume that as long as they have some sufficiently large quantity of some kind of money that’s likely to hold its exchange value over time, they’ll never want for wealth. This assumption is understandably made, because in the relatively recent past, this has been true a good deal more often than not, which feeds the belief that it will always be true in the future. But that assumption is lethally flawed, and it’s important to understand why. For the last three hundred years, as industrial society emerged from older socioeconomic forms and became adept at finding ways to use the immense economic windfall provided by fossil fuel energy, there have been two principal brakes on economic growth. The first has been the rate at which new technologies have been developed to produce goods and services using energy derived from fossil fuels. The Industrial Revolution didn’t get started in the first place until inventors and entrepreneurs found ways to put the first generation of steam engines to work making goods and providing services. At every step along the road from that tentative beginning to today’s extravagantly fueled high-tech societies, the rate of economic growth has been largely a function of the rate at which new inventions have appeared and linked up with the business models that were needed to integrate them into the productive economy. That’s the source of the innovation-centered strategy that leads most industrial societies to fund basic and applied research as lavishly as they can afford. The second major brake on economic growth is the relationship between the economy of goods and services, on the one hand, and the economy of money on the other. Just as wealth and money are not the same, as we’ve seen, the economic processes that center on them are not the same. The printing and circulation of money is not the same thing as the production and distribution of nonfinancial goods and services, and ignoring the difference between them confuses much more than it reveals. In my book The Wealth of Nature, I called the economy of goods and services the 'secondary economy,' and the economy of money the 'tertiary economy,' with nature itself – the ultimate source of all wealth – as the 'primary economy.' For the purposes of this essay and those to come, though, we’ll use simpler labels and call them the 'wealth economy' and the 'money economy'. During this three-hundred-year timespan, when the money economy stayed in sync with the wealth economy, economic growth normally followed. When the two economies got out of sync, on the other hand, growth normally faltered or went into reverse. There were (and are) two ways that the money supply can slip out of its proper relationship with the wealth economy. The first occurs when growth in the money supply outstrips growth in the production of real wealth, so that the more money is available to compete for any given good or service, and prices normally go up. That’s inflation. The second occurs when growth in the money supply fails to keep up with growth in the production of real wealth, so that less money is available to purchase any given good or service, and prices normally go down. That’s deflation. In either case, the imbalance hinders the ability of the wealth economy to keep producing goods and services, mostly by throwing a monkey wrench into the machinery of investment — the process by which the money economy allots extra wealth to the producers of wealth to assist them in expanding their ability to create real, nonfinancial goods and services. Whether it’s inflation or deflation that chucks the wrench into the gears, the result is flagging or negative growth. It’s the hope of keeping inflation and deflation in check that motivates the obsessive tinkering with economics on the part of so many of the world’s governments these days. However poorly that tinkering works out in practice (and it usually works out very poorly, indeed) the politicians can at least claim to citizens that they’re doing something to get economic growth back on track. Most economists, and for that matter most people who consider economic issues, think and act as though these two factors — the rate of innovation and the money economy’s habit of getting out of sync with the underlying economy of real wealth — are still the only factors that can get in the way of growth. That’s why proposals for putting an end to the current economic mess focus so narrowly on more innovation, on the one hand, and finding some way to gimmick the money economy so that it no longer drags on the wealth economy, on the other. Now, of course, scarcely any two people agree on what measures will get the two economies in sync again. Similarly there’s no general agreement over where government support for innovation ought to go. But there’s near-universal agreement that getting these two factors to work right is the way out of the ongoing global economic crisis. The disagreements between partisans of various economic schemes, and between proponents of various new technologies, make it easy to miss the fact that something is happening that’s clean outside the box of contemporary economic thought. The wealth economy and the money economy are certainly out of sync just now, but the problem isn’t in the money economy; it’s in the wealth economy. The production of real goods and services has run up against limits that are not financial in nature, and today’s economic orthodoxies can’t even imagine that possibility, much less respond to it in any useful fashion. In Part II: Slamming Face-First into the Limits to Growth we explain why, given our misguided efforts to solve the wrong problems, you can no longer assume that having enough money – of any kind – will guarantee that you will have enough wealth. Distortions in the money supply driven by the shenanigans of central bankers are not the only force twisting the relationship between money and growth. The key factor now is a contraction in the wealth economy driven by the economic effects of the exhaustion of easily accessible resources. There simply is too much money chasing a limited (and, in some cases, shrinking) supply of real wealth. I'm very glad we're going to be hearing from you more, JM Greer. It is so helpful to see the "unexamined presuppositions" that I wrestle with conceptually laid out in simple language from time to time. Podcast by report by article by post I'm recovering from some of these presuppositions and carving out new life patterns in response. Heartfelt thanks to everyone here. Sir, I am one of your biggest fans on Peak Prosperity, and I am so glad to see you signing on as a contributor! I agree that this kind of understanding about real wealth, versus a claim on wealth, is a very important distinction that many fail to see. Until one day when they look at their bank account balances and realize what they thought they had, isn't worth as much, or worth much at all! P.S. - Below, Exhibit A. 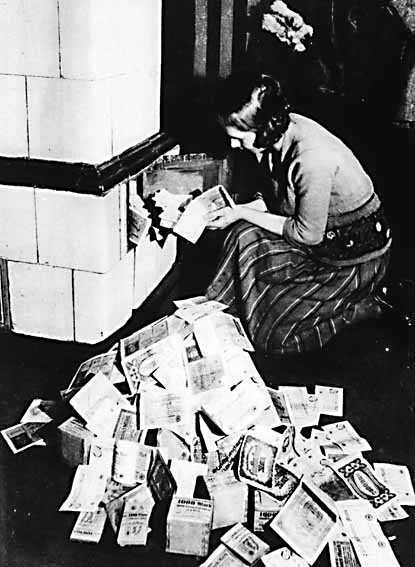 Early photographic evidence of a young woman of German extraction utilizing money for warmth. Debt gives money real value. Money can be used to clear debt. So if I use debt to buy something with value, my money then has value because it can clear the debt. I don't think that anyone is arguing that debt-based money has no value at a particular snapshot in time... unless you are sitting in a currency in one of those rare snapshots in time at the end of a hyperinflationary period where your buying power is asymptotically approaching zero... your debt based money does have some exchange value with real assets. The real question is the stability of this relationship between money and real stuff, or as JMG says, the, "habit of getting out of sync with the underlying economy of real wealth" which is of course happening around the world now via money printing. I for one am a big advocate of trading your debt based money for real stuff as soon as you get ahold of it... bought 25 2013 Canada Pronghorn Antelope Maples yesterday from Gainesville at the low premium of $2.59 before they went out of stock (look away..move on.. there is no Silver shortage here to see). I am also a big proponent of trading away my debt-based fiat money for things of value. That's why we used part of our retirement monies to put in a large kitchen garden, buy a well, install an airtight wood-burning stove, and add certain solar items (attic fan, hot water, some starter solar panels) to our residence. We have a little silver, but are trying to invest, and I use that word very deliberately, in whatever will lower our energy and food costs going forward. Should our currency fail, we can't eat precious metals, nor can we plug anything into them or use them to cool or heat our home. Precious metals have exchange value. I've been mostly investing in use value. But the snapshot in time is irrelevant because I already have something of value. If someone uses debt to purchase something of value, he no longer has to worry about whether his money can buy something of value (he already did). He just has to worry about his money being able to settle the debt. With interest rates at zero, using credit to buy something of value gives value to money so long as that money can be used to clear the debt. 1) Buying Silver coins with unbacked, debt-based fiat currency, about $35 per ounce. 2) Buying those same Silver coins with debt-based credit, and paying it back in the future with depreciated debt-based fiat currency... priceless. I would be wary of the idea of buying precious metals on credit, then paying back the credit at interest, hoping that the currency has devalued. 1. Time and terms. The repayment terms (with interest) may be sooner than the currency has a chance to devalue. The value of the coins themselves may fluctuate during that time. 2. During times of economic hardship - whether hyper-inflation, deflation, stagnation, etc. - jobs and money and buyers and sellers of goods can be hard to come by. During Zimbabwe's hyperinflationary early 2000s, the unemployment rate was well over 50%. During the Great Depression, the unemployment rate in the United States was around over 25% (and this is when self-employed farmers - were still a significant portion of the working population). It could work if one sells gold or silver for a lot of cash then, but that assumes one has timed No. 1 correctly. Exactly. My favorite CM quote is that "debt is future consumption taken today." applied to this discussion i'll modify that: If you're concerned about your future consumption, take it today! Debt locks in the purchasing power of money. Of course that only applies if 1.) you can borrow beneath the rate of inflation, 2. )you only allow yourself to buy things of true strategic value, and 3.) you have enough legal tender to liquidate the debt at any time. Our government has been trying to do this for years on a grand scale. The only way to make your government act in your interest is to align your interest. You are correct. I don't recommend this as a strategy because very few people can lock in a borrowing below the rate of inflation (assuming it's even known). But if you can borrow below inflation and you DO happen to know what inflation will be... Like for instance if you are a bank and can control them both... Then this is a great strategy. And I believe this strategy has formed the basis for US foreign policy for the past 50 years. I'm late to this discussion, and haven't read others' comments yet, but here's how I view it: wealth is the power to fufill one's desires. In fact, he could probably even pay for the design and construction of a one-megawatt thermal liquid fluoride thorium reactor (LFTR). In contrast, I can't do either of those things. But I can live in an air-conditioned home. There are plenty of people in Africa (most of them, in fact) who can't do that. The money economy is more than money supply on one hand chasing a supply of goods and services. It is also debt and velocity of the money, and for that matter the velocity of the debt. JMG, I think you should stay with the 3 economies as you did in your book. I think switching to two categories muddies the water and makes the distintinctions less clear. For example,we have had trillions of money printing in the last year or so but we have had deflation, at least asset deflation. Using simplistic definitions of inflation and deflation, by all rights we should have inflation as the inflationistas believe, but so far, not yet. It's all a magical mystery tour which I would guess most of us assume will be leaving the roadway, and crashing through the guardrail and over the cliff. Please explain. I agree Wendy and yours is a great strategy. If however you are looking at another option outside the United States then this of course will require a completely different strategy. I favor yours because my plans are to stay put or to move along to a lessor densely populated yet functional community. I favor where I live now because it is 5000 or less people, trains and depot (not being used but the infrastructure is there) in town, the water source is locally gathered (wells) and maintained, farming community surrounds the area and is farming community for many miles in each direction. The area is well stocked with protein and fruits. We are less than a half mile from historically major supply routes, and bartering and helping hands abound as a way of life. It is not usual and frankly the norm that 3rd and 4Th generational care takers run their farms with these families dating back well before the turn of the previous generation so that bodes well for the community as the social make up is pretty well established and can be relatively relied upon. Thanks for sharing your ideas on this and many other subjects here. I always find them to be valuable, well thought out, and well presented. In fact, I find myself thinking that if there were more people like you in this country, we wouldn't be in the mess we are in. In this particular case, I think your "investments" are intelligent and wise, albeit with some caveats. First of all, if you are considering them as "investments", then how well do they stand up to the scrutiny one must impose on their investments? First, how diversified are they? And second, how liquid are they? In other words, if you had to pull up stakes on short notice and move due to an unforeseen emergency or circumstance, how resilient is your plan of investing heavily in your house and property? And the corollary to that is, do you have sufficient rapidly mobilizable and portable assets to avoid being wiped out in the unfortunate event of the loss of your home and residence? Years ago, when I was thinking of investing heavily in real estate, I compiled a list of the pros and cons. Here is a partial list of cons against investing in real estate, particularly against investing heavily in your home. Natural disasters such as hurricanes, tornadoes, floods, fires (brush, forest, and structure), earthquakes, or volcanoes can quick render an area uninhabitable or, at the very least, very undesireable. Environmental catastrophes ranging from accidental toxin spills to deliberate toxin releases (Krisowaty Farm in Hillsborough, NJ, Love Canal in NY, etc.) to a Chernobyl to a radioactive Soviet era satellite crash could quickly render an area uninhabitable. Loss of water from drying up of an aquifer to drying up of a reservoir or groundwater contamination from fracking, mining, spills, etc., can make fresh water access very difficult. Social deterioration from undesireable neighbors such as a criminal element or incursion of racial, ethnic, political, or religious groups with which you may have conflict can create a great deal of stress. Encroachment secondary to infrastructure development including an airport, highway, or rail line built nearby or even establishment of a military base or concentration/prison/refugee camp can create an unpleasant situation. Eminent domain involving the government taking your property at their market price can come out of nowhere. A friend in NJ had neighbors experience this when the state converted a small local road to a highway and at the behest of a local Muslim organization, the state condemned their newly built homes to build an on/off ramp for an as yet to be constructed mosque. The Tennessee Valley Authority and WalMart are other examples. Changes in the economy such as in cities such as Flint with the automotive industry, Rochester with Eastman Kodak, etc. or in Texas such as when the oil industry had collapsed a number of years ago can drastically affect the desireabiliity of where you live. A terrorist event such as a biological release (my bet for the next "terror" crisis, whether real or an induced false flag event) or a dirty bomb could require widespread and longstanding evacuation. Ditto with contagion from a "natural" plague. Social unrest or riots can emerge for all kinds of reasons. War, including civil war, is one of the scariest possibilities. Many might completely discount the possibility of such an event. Reading stories of the idyllic life of wealthy Polish Jews hearing the sound of distant thunder one day (i.e. artillery) and experiencing their entire world turned upside down the next, however, makes on realize that such events are not impossible. Obviously, the likelihood of many of these events is small to almost non-existent but, in aggregate, if one does not consider the possibility that they may have to vacate their present abode quickly and permanently and plan accordingly, is one truly prepared and resilient? mobility update, aka the bugout option. Thanks, ao, I like your posts, too. Very useful and thoughtful they are. And of course, you're right - one should not put all of one's eggs in one basket. Long story short, we have diversification in the form of local and off-site options. Perhaps the most liquid local option is our nearby pond, rain barrels, and the well. We don't have a simple pump yet but we have a torpedo bucket from inside our well. Off site, our primary bugout location is on a 100-arce farm owned by three aunts that has two ponds and a well. It's very fertile and well-watered bottom land that will not require irrigation. My seeds are right next to my bugout bag, and all the tools are on the farm. There are quite a bit of other resources at the farm, including a cousin our age who has stocked her mother's place as a fellow prepper and dear friend. She lives in Charleston, and it's her bugout place. We have a secondary bugout location in the opposite direction, in the Appalachian foothills, at my brother-in-law's house. Not as well stocked but, hey it's secondary. So which is it, one wonders? Rent, prepare in place and keep one's options open or find a spot , hunker down and hope that the area you have chosen is not in a drought zone, say, or afflicted by one of the possible threats Ao has set out? I, for one, am struggling with this one. Good to hear. You had me a bit worried for you. First of all, the so-called "dig" was a fact. If you'd like to think of it as a dig, that's your perogative ... but the persecution card is as old and as tired as the race card so if that's where you're going with this, please save it for someone else. What really strikes me as odd though is that I've never heard of any other religious organization in that area given this type of consideration via eminent domain. Have you? My friend didn't think it was a bit odd. He thought it was very odd. So did the displaced homeowners. If you have any more information on this situation, I'd love to hear it and I'd pass it along to them. The point was give a personally known example of a highly anomalous situation that could blindside anyone, even someone who had planned very well. With regards to what one should do, it depends upon one's situation. What I wouldn't do, as Wendy correctly says, is put all your eggs in one basket. And you wouldn't want to play to your weaknesses but rather play to your strengths. If you're a relative stranger in an area with not much in the way of connections or assets, I'd probably rent and prepare as best you can in that setting with the potential for ready mobility being a strength of this particular situation. If you have a lot of family or close friends in an local area for mutual support and have sufficient assets, I'd probably buy a home. I wouldn't want to put all my assets into my home, however. I'd want to have some money and assets put aside that give me a plan B option for portability and mobility, if the need should arise. Obviously, there is no place that is totally free from risk and even an area which has 99 things going for it may suddenly sprout the 100th thing that makes it an unwise choice. But one wants to tilt the statistical odds in their favor and that involves doing abundant research, both online and on the ground and in person. Remember, the map is not the territory. I agree backup plans are needed but at some point you just have to live your life and enjoy what you have. I have had great luck with rental properties. I used to worry about all the little things that could happen but now realize you can just walk away and start over. I did sell a few and diversify my money. I agree with you about just living your life and have stated so multiple times on these forums. In terms of rental property, I know many people who have done well with them (in the past) and continue to do so. That is changing or will be changing for many landords though. I'm a landlord myself and I haven't lost any money yet but as I said, it's been my poorest investment, both in terms of monetary returns and in terms of time invested. I think a lot depends on one's personality too. We've delegated management because we just don't want to be bothered with unplugging someone's toilet at inconvenient times. Plus, I don't deal very well with foolish people who do foolish things and then whine and complain about it. For example, someone who dumps food down a bathroom sink and then complains when it gets plugged up. But if one has the personality to deal directly with this type of silliness, in many areas, one can do OK or even well. We have a local, very nice, extremely well managed, large apartment complex that has the highest occupancy rate in the state. People don't leave. You have to wait until they die before you can get an apartment there. But the circumstances there are unique and this complex was built and established at a time that was much more fortuitous economically. In terms of just walking away, that's more easily said than done. If you've read some of the stories popping up in the news about this issue, in many jurisdictions, you can't just walk away from your responsibilities. There are a number of legal issues that can actually cause your problems to multiply and your situation magnify into a nightmare. I can't find a link right now but the stories are out there and growing in number. I recently became obsessed with economics when it started to dawn on me that our system for exchanging goods, services, and money is completely out of whack with any "real" value of goods and services. So naturally it is exciting to see so many other people thinking about these same things. This is the tip of a much larger conversation than can fit in a comment. But in a nutshell, I think that we need an objective system for rating the value of any good or service based on actual resources used to produce it. Much like transparency of nutritional information is a basic requirement for any food packaging, I think that complete transparency of resources will be instrumental in creating the shift in perspective needed to get our money in sync with our actual wealth. The implications of such transparency are far-reaching. I look forward to reading "The Wealth of Nature". Similar to my plan. Family farm in E Iowa (my Mom grew up on it). We had a big family reunion on the farm last July, and several of the family members there (my Mom's bro still farms it with the help of one of his sons -- and the other lives juuust down the road with his family and helps out at harvest with the combining, etc.) made subtly clear in conversation that I'm always welcome back on the farm. Nobody wanted to discuss the 3Es outright other than in generalities, but they're sharp enough (if reticent conversationally -- that's very "Iowa": less talk, more Do) to smell what's coming.